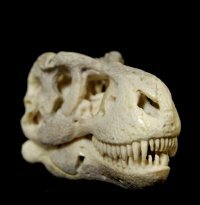 Finest T-Rex SKull Carving [CARVTRex] : Fossils Online, Welcome! The detail on this carving is absolutely amazing. The attention to detail on this carving is nothing short of amazing. 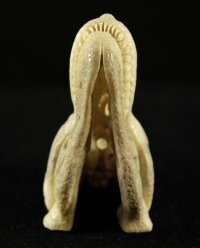 The jaw is only connected to the skull at the back of the jaw where it would hinge on a real skull The teeth are carved in 3-D... not just carved onto the surface. They somehow managed to carve each and every tooth individually. The texture, the skull sutures and the attention to detail depicting the individual skull bones of a real tyrannosaur skull is impressive. This is a work of art that is cannot be fully appreciated in photos alone. Stunning work. Carved in Bali, these artisans show amazing skill in their carving ability. I was so impressed, that I had to buy some to share. 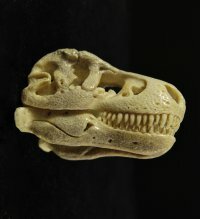 This skull measures 2 3/4" long and 1 3/4" high.